Rooster decor in the kitchen or sunroom adds a burst of color to the space.Save Up to 60% on Kitchen & Dining at DealYard! I love Color. I also love roosters. Therefore the two together are the perfect decorating combination for my casual kitchen. If you also love color and don't know what "theme" to decorate your kitchen in - consider decorating with roosters in your kitchen. You can use these ideas on this page and apply them to your home no matter what you enjoy collecting. I have a collection of various sized roosters in my kitchen. I have collected roosters for several years and had alot of them when I moved here over 4 years ago. My kitchen is also a small room (something else we plan on improving someday soon I hope!) So therefore, displaying my collection of roosters has presented a few decorative challanges. That is ok, I have overcome the space challenges and have my rooster decor out on display on areas that does not interfere with limited my workspaces. Don't forget - you can also Use Rooster Decor in your Garden too! Don't miss the PAULA DEEN COOKWARE AND TASTE of HOME COOKBOOKS OFFER AT THE BOTTOM OF THIS PAGE! Did you notice the photo on the right at the top of the page? 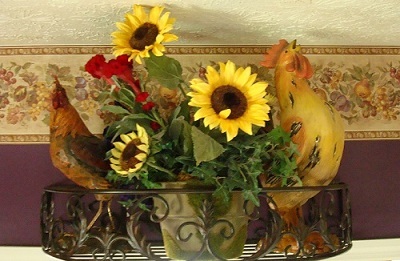 The 2 roosters and pot of flowers are displayed together in a wire shelf. You can see that the shelf is close to the kitchen ceiling. 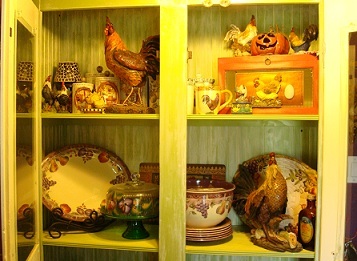 Here is a photo of that shelf without the rooster decor inside of it. This photo shows the empty shelf. This shelf is actually a pot holder too. I just don't use is as one. I have placed the metal shelf above a cut out in the wall that seperates the two rooms from each other. Eventually that cut out will become a doorway to the dining room. I prefer a more open floor plan than the closed in kitchen I have now. Notice the border on the wall and the wall color. YES I DID actually paint my kitchen PURPLE! Shocking isn't it? Actually I get alot of compliments on my color choice for the kitchen after people see it. Find out more about Decorating with Color here. This website is all about expessing your style and making YOUR house a Home that you love. I have done that with my home and along the way we have changed the entire look of this house on the inside. I have also changed all of the landscape on the outside. Make sure you see how we changed our front yard landscaping. And how we also made many changes in our backyard too. The kitchen had lots of changes made immediately after I moved in, which included new appliances, cabinet hardware, and new paint and wallpaper border. We also added a restored antique armoire (cabinet) in the kitchen. More on that below. We still have more changes planned including opening it up more and adding new flooring, countertops and backspash to update it to match all of the updates that we have made inside our home. 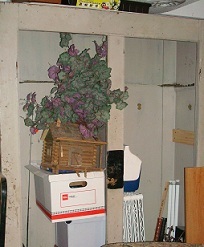 In the mean time we have focused on other more urgent areas of the house such as our basement first. We also made lots of updates upstairs which included painting all of the rooms and . adding lots of Architechural Molding in the living room, hallways and bathrooms. You can check out those pages at the links provided above. 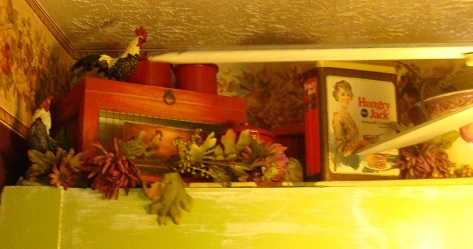 Earlier I mentioned that I had to overcome some space challenges to display my rooster decor collection in my kitchen. With limited counter space and cabinets that have soffits above them I did not have alot of room for the variety of roosters that I own. I decided to decorate the top of the refrigerator. The photo on the right shows the area above the refridgerator without any decor items displayed there. The photo on the left below shows a display that uses one of my trunks. I love trunks! I use them all over the house. This trunk is one of 3 in a set. The other 2 are also in the kitchen. I don't have room to display them stacked together, so I have seperated them and used them in various displays. 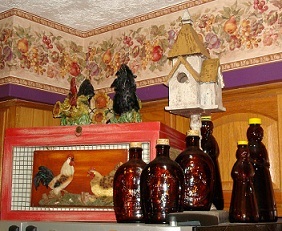 On the left see the photo of the top of the fridge decorated with the trunk, a figure on top of a rooster and hen and then I have added my collection of antique syrup bottles with a birdhouse behind them. Display your collections for everyone to see! Restore an Old Item and give it a NEW use for YOUR Collections! Earlier I mentioned that we added a restored armoire (cabinet) to our kitchen. We have one wall that did not have any built in cabinets on it. We decided to add an antique piece to the room. We restored an old cabinet that my husband had saved from the dumpster for a job site many years ago. It had been in the garage waiting to find a permanent home for years. This photo shows it with the doors removed, while in our basement while we were doing our basement remodel project. The photo on the left shows the door,without the inside panels. This was a big project. The cabinet was so rough that my husband was surprised when I suggested using it in the kitchen. We had considered it for the laundry room of shed originally. I saw potential in the item. It was sturdy (with some additional support) and with some work and lots of love we could make it into something we could use in our kitchen. And I also enjoy having a one of a kind piece of furniture in my home. Both of us love old items with a history, and that makes us restore items for our home. At the time I had placed different furniture items in the kitchen and decided that the cabinet was a better choice for room. The cabinet had to be competely stripped of all paint. Then it was sanded. I wanted it to look old, so we left some of original dents and wear on it. I decided to paint the cabinet an apple green color. I antiqued it in the same color as the trim in the house. That color is vanilla bean. (ivory). I know, most people choose white paint for trim colors. I do not like white paint on anything except ceilings. 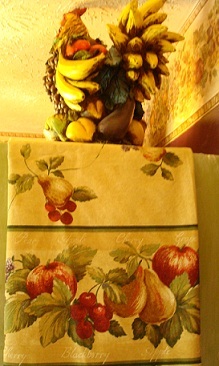 I wanted something bright and colorful for the room and the apple green looks great with the fruit and rooster decor in the kitchen. The cabinet was completely lined in beadboard on the inside. New shelving was installed inside the cabinet and painted and antiqued to match. The bottom 2 shelves are used for storage so we used beadboard on the bottom part of the doors and glass on the top part so the decorative items would show through. See another trunk inside the cabinet. 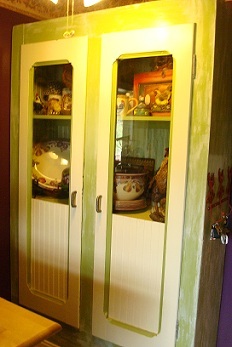 See these photos of the restored and decorated cabinet. The finished cabinet was actually mounted to the wall and baseboard molding to match the rest of the room was wrapped around it. The antique cabinet is now a permanent part of the kitchen. And I love the look and the function of the piece. It is perfect for the decorative items and provides much needed storage below. See the top of the cabinet. 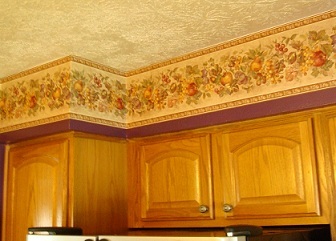 As you can see the top of the cabinet is not to far below the kitchen ceiling. It is also very close to the ceiling fan in the room. But that did not stop me. I still use the space for my rooster decor. See how I decorated it. See the photo of the folded tablecloth, on the right. Notice my trusty feline companion hard at work inspecting the fabric choice I had made! Then notice the bowl in the photo in the center. See a theme here? 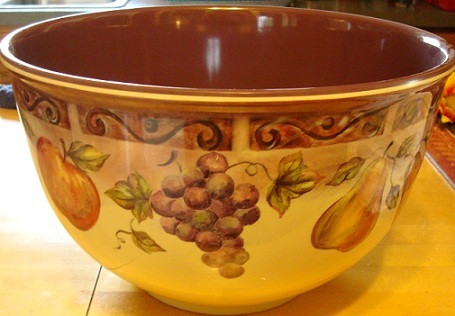 The theme is part of the fruit motif that is also included in the kitchen decor. 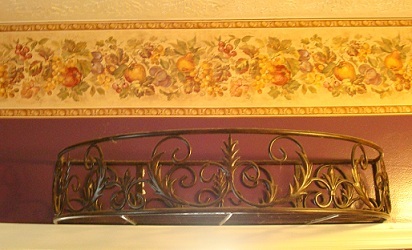 The border at the top of the walls is fruit too. This bowl is what influenced me to make the room purple. I have a platter, plates and a bowl to match in this pattern. I love the look and decided to paint the room to match. 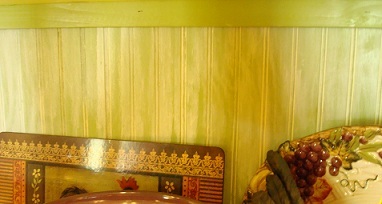 I used the tablecloth in the photo above, as part of the display in top of the antique cabinet. See the photos below. Rooster Decor and Fruit - Making it all tie together with a single item! And finally, notice the rooster that looks like it is made from fruit! He was my last rooster find, and he ties the two looks together perfectly - the fruit theme and the rooster decor are great partners! What do you collect? Wine decor? antiques? birdhouses? Coke products? Americana? advertising cans? You can make any of these items work together if you are creative with your displays. And that is what makes it fun after all. Ok Paula Deen Fans, I have found her cookware, in Purple no less! "Pouring through antique shops with my Aunt Peggy is one of my most cherished memories. This line was inspired by the many treasures she and I found on our adventures. My wish is that they are as fun to collect for you as they were for me." Click on the cookware photo for full details about the cookware, also available in other colors....although I don't know why it should be...(ok I'm kidding). Enjoy you new cookware, and cook up something tasty from the cookbooks offered in the banner below! 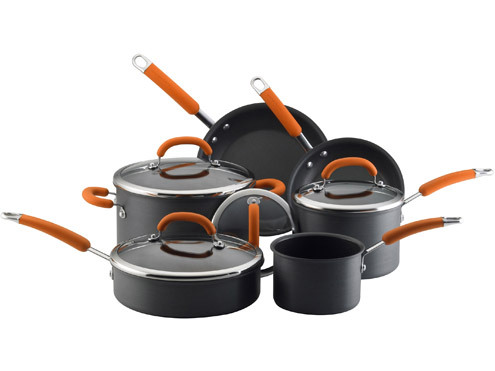 Racheal Ray Cookware On Sale! Rachael Ray Nonstick Orange Cookware Set: This cookware set is an exceptional value, including all of the pans needed to equip your kitchen with the most used cooking pieces. As the set contains only basic pieces, you'll really use each and every pan. It includes sauce pans for whisking a homemade sauce or cooking your morning oatmeal, a big stockpot for soups, stews or boiling pasta, and skillets (probably the most used pan in any kitchen) that will help you turn out perfect pancakes or a tasty tuna melt.